careful of approaching the dog and to keep their dogs away. It is so common for people and other dogs to think that the sight of another dog means that it is open season for play and affection without regard to what is going on with the other dog. That other dog may be recovering from surgery or injury, is in training or being rehabilitated, or is nervous around strangers or other dogs. No matter what the reason, these are dogs that just need others to keep their distance and give the dogs some space. 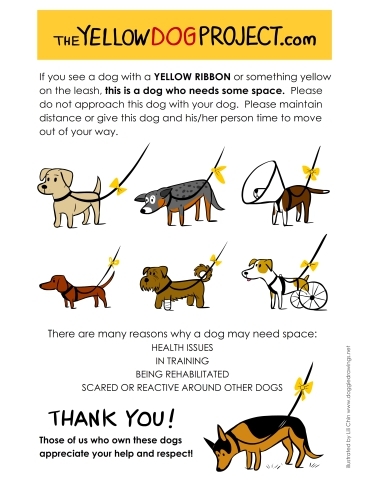 By tying a yellow ribbon to the leash of a dog with any of these issues is a way to let everyone know that the dog needs a little extra TLC and understanding. The other side of this coin is to educate the public about this signal. 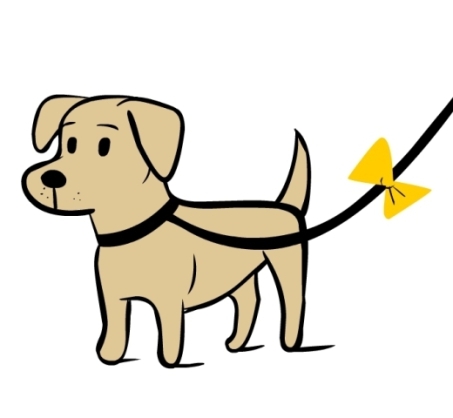 Once the symbolic yellow becomes common knowledge many dogs will be more comfortable in public. It may also cut down on the number of bite incidents and reports of dogs acting aggressively. The project started in Sweden last year and has been spreading quickly around the world.